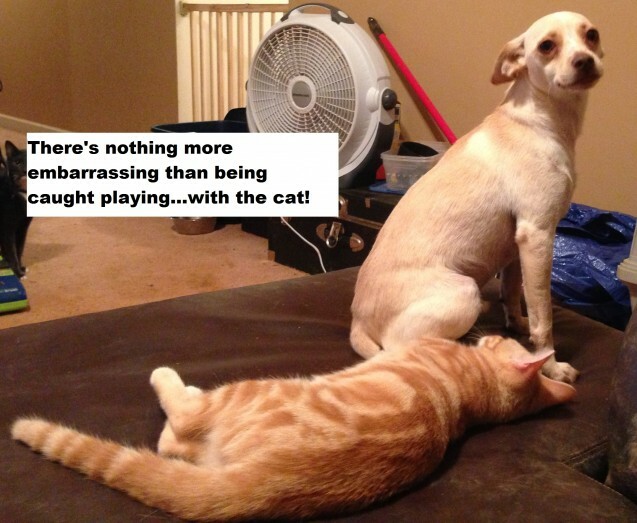 There’s nothing more embarrassing than being caught playing…with the cat! Jack aka Jackrabbit came into my foster care from Heart of GA Humane Society near Mildgeville, GA as a cat chaser so I couldn’t resist snapping a picture of him actually playing with one of the cats after only 2 weeks here. He is a 1 year old neutered Jack Russel mix who is waiting on his forever home. He gets along with every person, dog and now cats! Posted July 12th, 2013 . I would really like to know how you got him to be cat friendly! I could use the trick on my girl.. to say that she has a deep dislike for cats would be an understatement! Since cats are the one thing that my otherwise wimpy hound dog actively dislikes, I’d like to know the secrets of cat tolerance (or even like!) too! It depends on so many things, in my experience. Dog breed and prey drive, cat temperament, whether they were exposed to each other when young, etc. Terriers are bred to go after vermin and they are tenacious, so they will naturally chase cats, as will hounds and most working breeds. A skittish cat that runs away is also more appealing, as it triggers these tendencies, whereas a cat standing its ground will be more of a deterrent and could possibly lay down a foundation of a truce. That being said, all cats and dogs have different temperaments and personalities and I think asking a trainer for some pointers is always the ways to go. 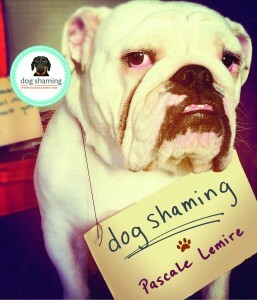 Show the dog that it’s not ok to chase Kitty and offer an alternative activity. Praise when he or she interacts with other small animals in a positive manner. My cat has that same pattern on him but a darker orange. He also plays with the dog. Awww, my little Rattie gets the exact same look on her face when she thinks she’s been caught doing something she shouldn’t be (usually being up on the bed when she’s not supposed to be). I hope Jack finds a good family to spoil him rotten.